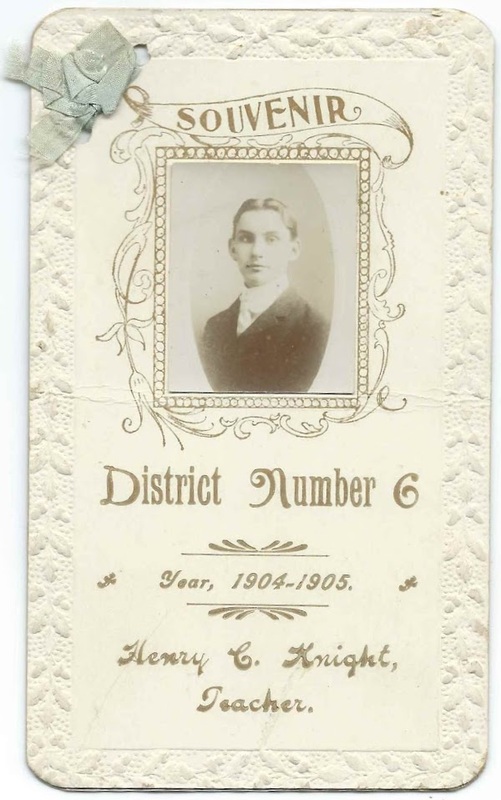 Souvenir of District Number 6, year 1904-1905; Henry C. Knight, Teacher. The souvenir consists of two cardstock pieces, measuring about 5-1/4" by 3-1/8". tied together with ribbon. The cover piece features a photograph of Henry C. Knight. The second piece contains the names of Henry's pupils. Henry C. Knight was born February 6, 1883 at Eliot, Maine, the son of Thaddeus and Sarah J. (Welch) Knight. In 1910, Henry married Bessie M. Staples, daughter of Willard and Florence (Dixon) Staples.